“I say, ‘I wonder what’s going to happen exciting today?’ ” said Piglet. May you wake up every morning looking forward to whatever excitement the day holds, breakfast, lunch, dinner, or otherwise. In a small sauté pan, heat the garlic and chile in oil to 140°. You can use a candy thermometer to monitor the temperature, or you can just set the pan over the lowest heat on your stove and every once in a while, stick your bare finger in the oil. If you can keep your finger in the oil for more than a few seconds, it’s about the right temperature. 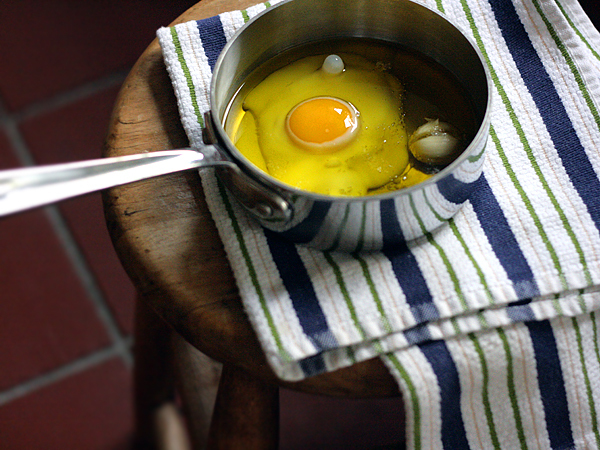 Crack the eggs one at a time into a small ramekin or coffee cup (I used a ladle) and slip each egg into the hot oil. I poached the eggs one at a time. Poach the eggs for about 3 minutes (the eggs will occasionally pop and sputter). 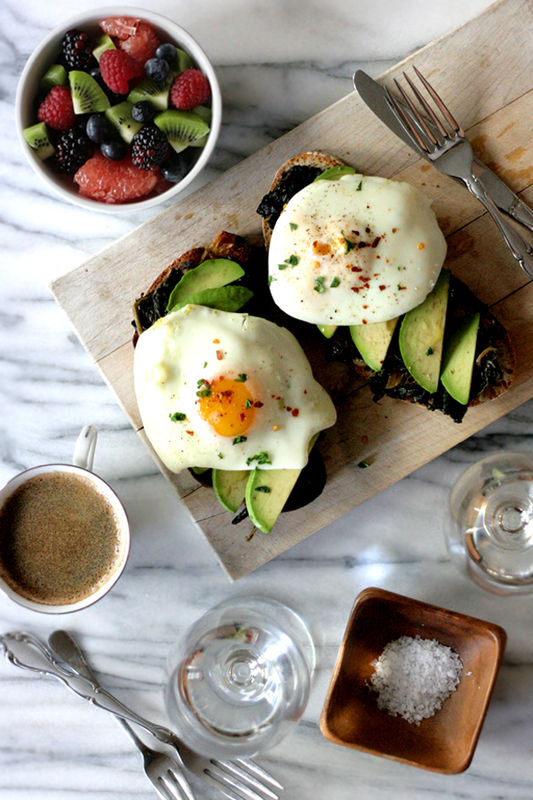 Remove each egg carefully with a slotted spoon and place over grilled toast piled with garlic-braised kale and fresh avocado. Sprinkle coarse sea salt, freshly cracked black pepper, crushed red pepper flakes, and chopped fresh parsley over the yolks. The past couple of weeks, I’ve been waking up before 7AM, sometimes even before 6, without an alarm clock. I know that happens naturally as our internal rhythms gradually sync with the seasonal transition from winter to spring, but this is something more severe, since it’s three hours earlier than usual for me. At first I was waking up trembling, sweating, gasping for air, my entire body strait-jacketed to the bed with the sheets and pillowcases that I must have torn off the pillows sometime during the heart-wrenching nightmare that I never resolve by morning. I am more exhausted when I wake up after a night’s sleep than I am when I collapse into bed at 2 AM after a cross-my-heart 18-hour day. These last few days, though, I still wake up with the birds, but it’s gentler. And instead of lying there panicking about the eighthundredninetysevenOMGtoomuchIcantdoit things I have to accomplish that day, most of which have to do with quickly moving out and slowly moving on, I remind myself that I’m alive. That there is an entire lifetime of happiness, love, and yes, even a little more hurt, still ahead of me. That there is such a thing as olive oil poached eggs. Next post: Oysters. Wine. Be Happy. Make Plans.